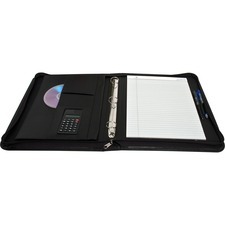 Sophisticated, legal-size pad holder offers the look and feel of leather, and an eight-digit battery calculator. Wraparound zippered closure secures your important documents. Pad holder also features three credit card slots and a business card holder. 1" expandable section holds documents up to 12" long. Pen and pencil holder are designed to hold two writing instruments. Single handle on the back spine allows easy transport. Pad holder includes a letter-size writing pad.